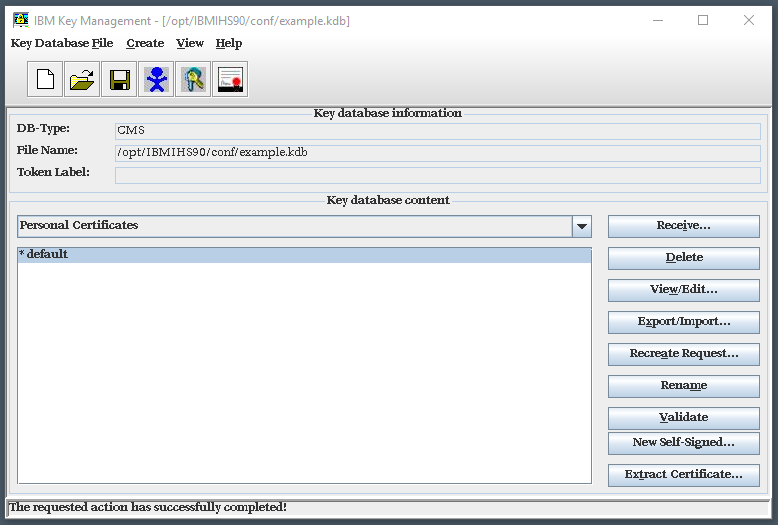 This assumes you have reviewed IBM GSKit (Global Security Kit) - Getting Started (command line) or IBM iKeyman - Getting Started (GUI) and that you have created a key database. The -create option can be used to create a self-signed certificate in a key database. In this example, the name of the certificate will be "default". After the self signed certificate has been created, you can then use the -list option to list the certificates in the key database and use the -details option to view the details of the self signed certificate. Did you notice that this command creates the private key, certificate signing request, and the public certificate? For example, 2048 is the size of the private key and 365 is when the public certificate expires. Select New Self-Signed. Complete the form and the self-signed certificate will be created. In this example, a self-signed certificate named "default" was created.